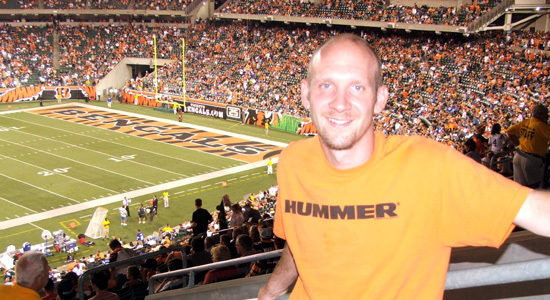 Tom Parfitt gave me tickets to tonight's Cincinnati Bengals pre-season game against the Indianapolis Colts. I invited Tommy to go with me and off we went to the Queen City. There was an traffic accident on the interstate which slowed us down and we missed the opening kickoff and the Colts first touchdown. Luckily that was their only score during the game. 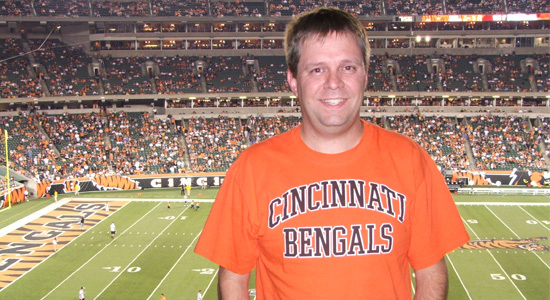 The Bengals then went on to score thirty-eight unanswered points. It was a cool summer evening with clear skies. The stadium was about half full and the crowd remained mostly quiet throughout the game. This was Tommy's first pro football game. We both enjoyed our great seats at the game. Thank you Tom. Click here to see all my pictures from the game.